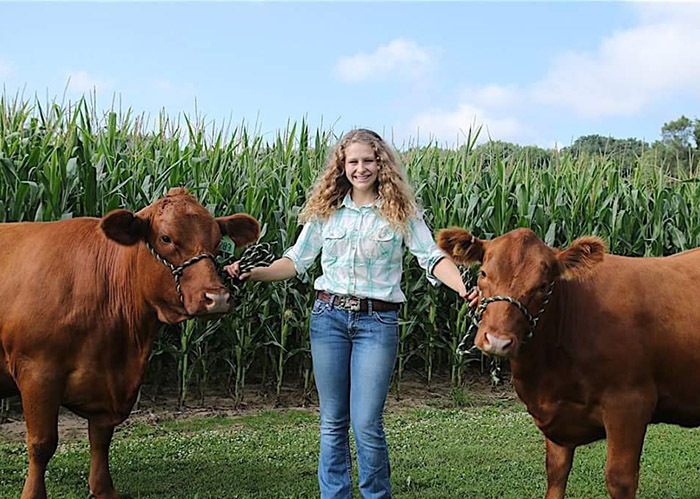 Read Sarah Alber's story about a life in agriculture and how the FFA, Collegiate Farm Bureau and the University of Wisconsin have helped her to stay connected with other agriculturists, help teach future agriculturists, and keep up with current events in the industry. Sarah Albers on the farm with two of her herd, Susie left and Daisy right. Growing up around agriculture, I fell in love with the most important industry in the world. Despite my family’s operation transition to cash cropping when I was eight years old, my sister and I started up a small swine herd when I was eleven. Although many aspects of life have changed since then, I still raise my own beef and swine herds along with working for a dairy farm. This background in production agriculture lead me to want to be an FFA member as soon as I saw what those student leaders could do through an organization that couples leadership with agriculture. Throughout eighth grade and high school I was active in the Sauk Prairie FFA Chapter. I took on officer positions of treasurer, Community Development Vice President, followed by President. I also participated in various activities and competitions such as the Veterinary Science Career Development Event, Fourth Grade Food for America, and Parliamentary Procedure. 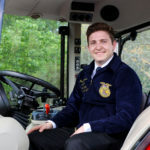 These experiences all taught me their own lesson from goal setting, to time management, to leadership skills; FFA instilled valuable life skills I will carry with me forever. With the FFA making such a large impact on my life I was looking forward to staying involved after graduation. Sadly, there isn’t a Collegiate FFA Chapter at University of Wisconsin River Falls; however, there is a Collegiate Farm Bureau I belong to as well as the Sauk Prairie FFA Alumni Chapter. Both of these agriculture organizations help me stay connected with other agriculturists, help teach future agriculturists, and keep up with current events in the industry. 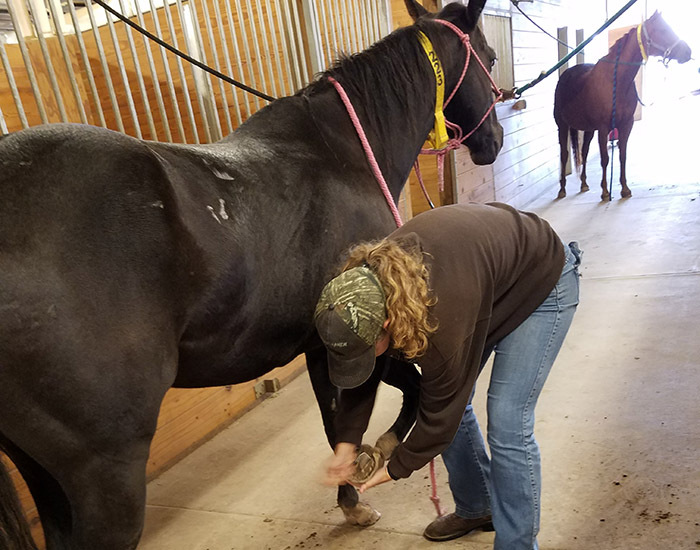 Here we see Sarah Albers picking hooves to help ensure equine well being. At the University of Wisconsin River Falls, I am majoring in animal science with a meat animal emphasis. Since I am a freshman, I am only enrolled in one animal science class as well as one plant science class as electives. 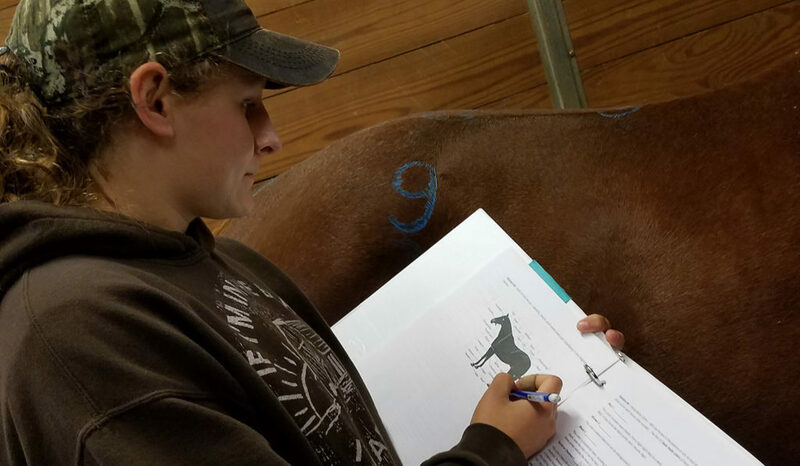 In animal science we’ve been working through a few different units with one being about the equine industry. Our professors provide us with hands-on learning opportunities which I believe is a key aspect to truly understand what is being taught. The pictured horse was labelled with paint to help us learn anatomy on a more physical level as well as get us working with live animals rather than looking at pictures from a book. This helps ease students with all backgrounds into being comfortable working with animals of all sizes. 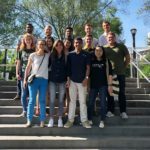 Being in more beginner level classes, on the pathway to becoming a large animal veterinarian, doesn’t stop me from making connections to what is currently going on in the agriculture industry. As E.M. Tiffany, the author of the FFA creed, wrote, “I know the joys and discomforts of agricultural life and hold an inborn fondness for those associations, which even in hours of discouragement, I cannot deny.” Many agriculturists can attest to the truth in this statement. Currently, the dairy industry especially is facing some long hours of discouragement with the failing markets, but with innovations from AGCO and their brands, such as GSI’s Z-Series Bins with Flexwave® Technology, farmers are able to prevent themselves from injury as well as complete tasks, such as unloading grain, in a more efficient manner. These new technologies allow farmers to spend their time focusing on other aspects of their facilities to allow for greater improvement. Just like AGCO, farmers are always striving to meet consumer needs and to exceed their expectations. Whether it is making sure that we produce meat in the most humane way possible, to the constant lack of antibiotics in the milk being sold, farmers continue to toil away despite all of the setbacks they face. They need help from our future generations to have individuals willing to step up to the plate and fill the expected 60,000 new positions in the industry every year according to the U.S. Department of Agriculture. While farmers are at the core of the agriculture industry, it takes many others to keep the industry going. This idea of being able to be involved in agriculture off the farm is a major focus in FFA especially. As an officer trying to recruit new members, I often had to explain that agriculture is more than just cows, plows, and sows. Farmers need the help of agronomists, seed salesmen, marketers, artificial insemination technicians, veterinarians, and many others to keep providing food for the world. Trying to get other students to understand how many people are really involved in providing us with the food we eat is not an easy task, but it is one that needs to be done for people to truly value where their food comes from and all of the people involved in getting it there.